Elderhorst Bells, Inc. supplies new and used cast bronze bells and ringing equipment to churches and institutions across the United States and Canada. We sell and install precision tuned bells from the finest European Bell foundries. Whether a single bell or a complete cast bell carillon is required, Elderhorst Bells, Inc. can supply a quality musical instrument that will last for generations. Elderhorst Bells, Inc. also provides architectural bell shells and digital bell carillon systems to provide for the look and sound of bells, without the weight and cost of real cast bronze bells. In addition to our selection of bells, Elderhorst Bells, Inc. also offers bell repair and full bell restorations to church bells and tower bells. 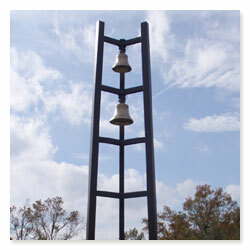 Click here for bell repair and restoration information.